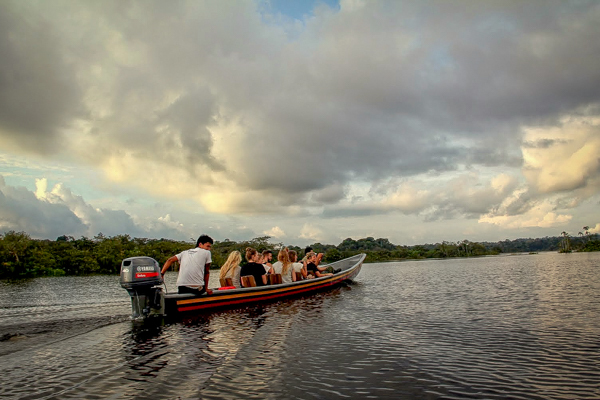 Taking a tour when visiting the Amazon in Ecuador is a unique way to see one of the most mythical and beautiful places on earth. Stretching into eight countries, the Amazon rainforest is such a big part of South America’s nature and indigenous culture, yet it is often skipped by backpackers thinking it’s too expensive or too hard to get there. Nothing could be more wrong! 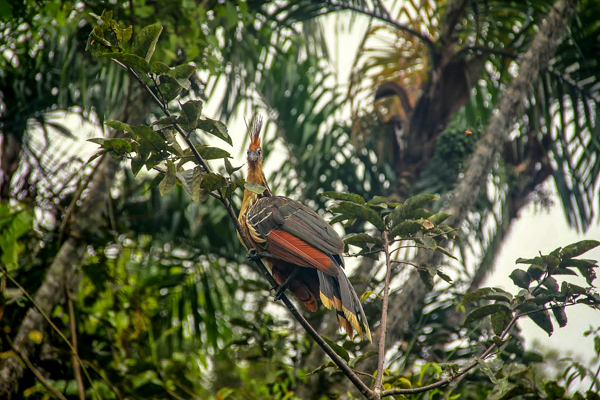 In this post I’ll break down my visit to the Cuyabeno Wildlife Reserve in Ecuador to show you that backpackers can visit the Amazon easily and cheaply. 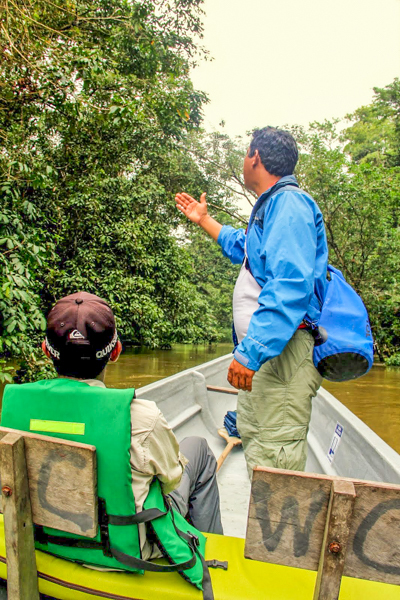 Here, you’ll find everything you need to know about what it’s like to visit the Amazon – what you see, what you do, what’s good and what’s bad. 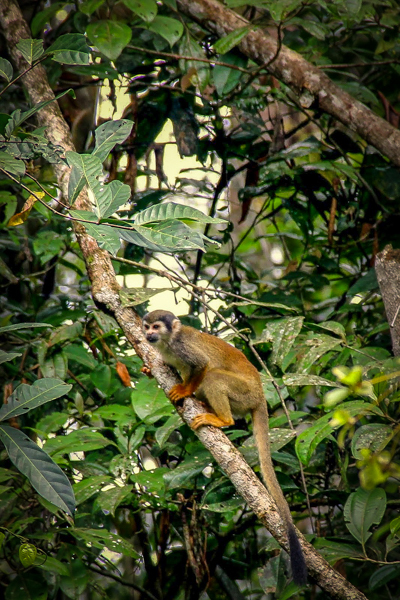 What To Expect When Visiting The Amazon In Ecuador? 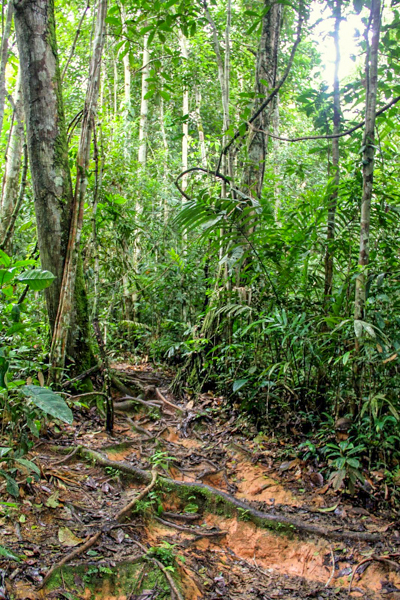 The easiest way to explain what visiting the Amazon rainforest is like, is probably just to imagine that you’re on the set of National Geographic documentary. Playful pink river dolphins suddenly appear in the pitch-dark water, shy anacondas slither silently between the branches and tarantulas the size of a grown man’s fist lurk in the dark, waiting for the perfect moment to attack their prey. 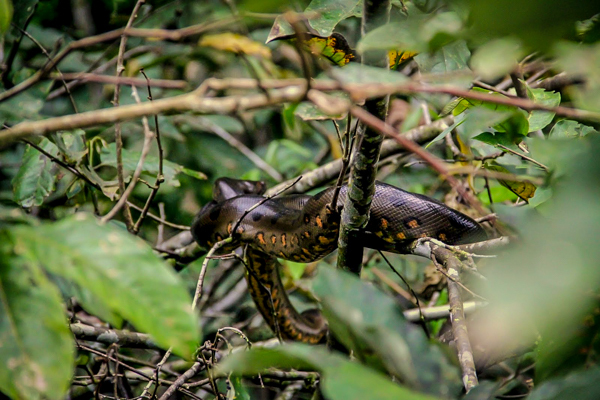 Some of these animals, such as the anaconda, can take your guide a few days to spot, but you’re guaranteed to see howler monkeys, sloths, exotic birds and plenty of creepy crawlies on a daily basis. The Amazon rainforest is also home to many indigenous communities. 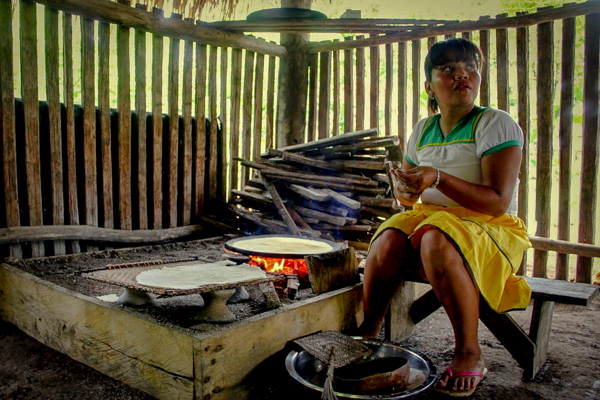 In Cuyabeno, the Sionas are the main tribe with an estimated 250 people still living in the jungle. Most Amazon tours include a visit to the Siona village but you’ll be disappointed if you’re expecting to see naked indians with bows and arrows. First, we need to kick off this Amazon adventure! My Amazon tour officially started in El Puente which is located 200 km east of Quito. From there, the tour company bussed our group of 25-30 people an hour further east to Lago Agrio, the launching point for the canoes, where we were split into smaller groups depending on which ecolodge we were staying at. 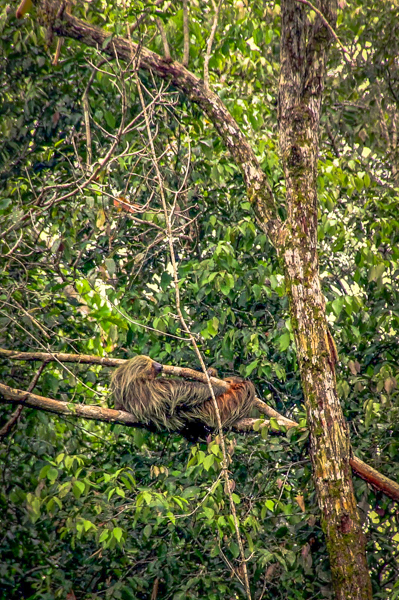 Within the first fifteen minutes, our guide had already pointed out a couple of sloths chilling on some branches high up above our heads. Not a bad way to spend your days, eh? I still remember how blown away I was on that first canoe ride gazing up at this massive green wilderness that roars day and night with the sounds of millions of creatures. I’ve always dreamt of visiting the Amazon and finally being there was a major highlight on my South America backpacking trip. 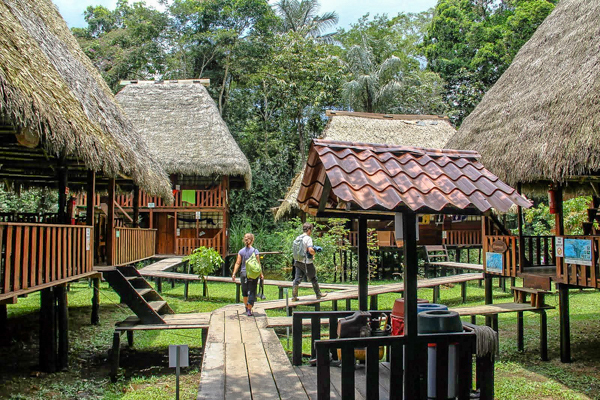 I stayed at the lovely Guacamayo Ecolodge, a small complex of wooden huts with a birdwatching tower and a restaurant right on the river bank. Every room had two beds with mosquito nets, a bathroom and a little porch which was all very clean and comfortable, especially considering that you’re in the middle of the rainforest. 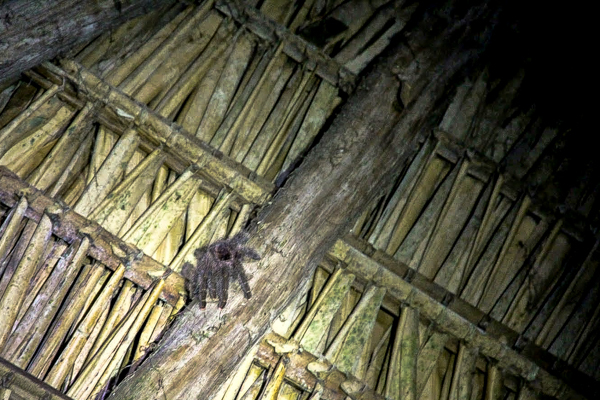 Some two metres above us, hidden in a dark corner of the candlelit restaurant, was the biggest (and only, thank god) tarantula I’ve ever seen. 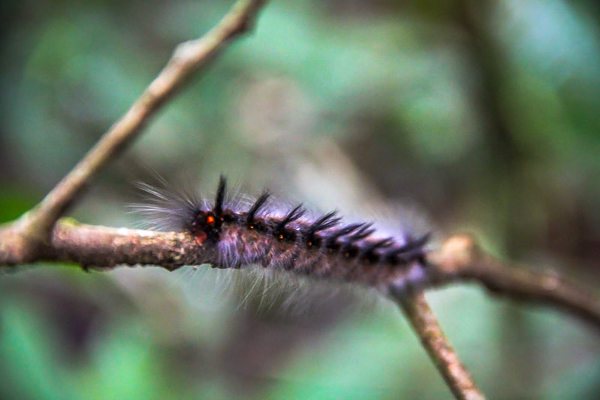 Long, hairy legs and eyes that glistened in the light of the flash light – yuk! Good luck enjoying your food with an eight-legged monster like that watching your every move. Say hi to Suzy, our tarantula pet! The night walk took about an hour and was quite interesting. Led by our guide, we walked in a line through a dense part of the jungle located only a short canoe ride from the ecolodge. All the animals we saw where on the ground and were mostly types of spiders or insects. We spent the entire second day spotting animals and learning about their life in the Cuyabeno Wildlife Reserve. From the ecolodge we sailed through a maze of narrow river branches winding deeper and deeper into the Amazon. At this point we’d seen different types of monkeys, sloths and colourful exotic birds, but still no anacondas or pink river dolphins. After about an hour we stopped at an island and went for a daytime walk in the rainforest. 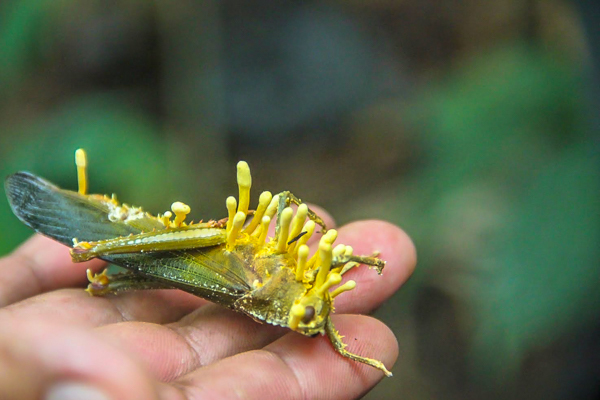 Like on the night walk, we learned about all sorts of creepy crawlies and plants that live here in Ecuador’s Amazon. What I remember most from the walk, though, was the mud; it had rained recently and we basically jumped between mud pools. Good thing the ecolodge provided us with rubber boots! And then, shortly after we left the island, our guide suddenly turned off the engine and told us to look at the water. There, some 15 metres from the canoe, a couple of dolphins were playing, appearing in different spots every few minutes. 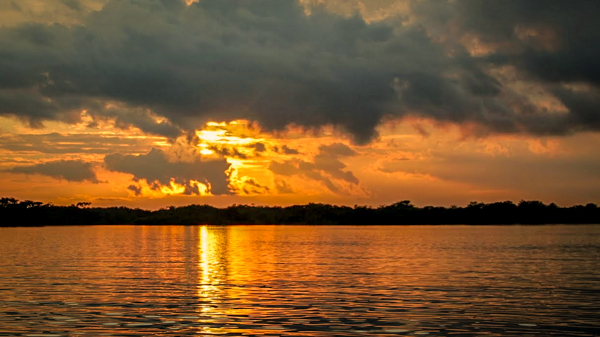 My favourite part of the entire Amazon tour was in the afternoon when we sailed to Laguna Grande to see the sunset. Out there on the water, the sounds of the jungle become but a distant murmur and all you hear are the splashes of people jumping into the river for a sunset swim. 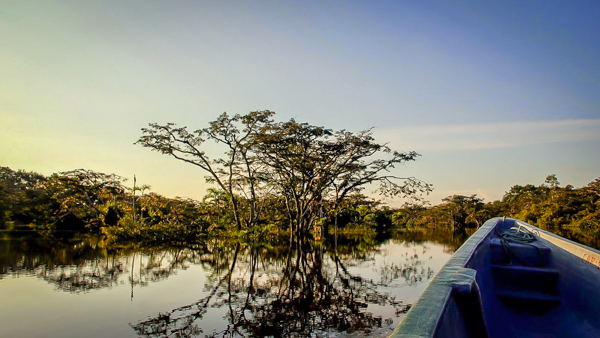 Imagine sitting in a canoe in the middle of the jungle and seeing this… Stunning. That’s right, did you know that you can swim in the Amazon? That is, of course, if you don’t mind bumping into a caiman or two. Once the sun went down, our guide told us to turn on our flashlights and point towards the river bank. Every now and then, you’d see two red dots in the dark which were in fact caiman eyes. On our last full day, we went to see the Siona tribe to get some cultural perspective on life in the Amazon. Nowadays, the tribe works together with the ecolodges to show tourists their once traditional ways of life. Sadly, this was the only part of the tour I did not enjoy. The program for the day was to first visit the village and then go a little further down the river to a remote hut where a shaman would tell us about the spiritual world of the Sionas. Considering that the Sionas live in an easily accessible part of the Amazon I can’t really blame their village for looking like any other village you’ll find in rural South America. What I can blame them for, however, is how unauthentic the visit felt. We were greeted by a local woman who over the next couple of hours took us on a tour of the village and then showed us how to make bread from the yuca plant. Although the presentation itself was interesting, it was hard to forget the fact that we saw her sitting on her cellphone and dressed in her normal clothes when we first walked into the village. Before starting the presentation she simply put on a traditional dress, which felt a bit like she was just dressing up for the gringos. Things didn’t get much better at the shaman’s hut. When we arrived, we had to wait outside the hut for a while as the shaman was not yet done with the previous tour group. Again, not the most authentic setup. Once inside, the shaman told us about the use of medicinal plants in the jungle and how the knowledge of their usage has been passed down from generation to generation. 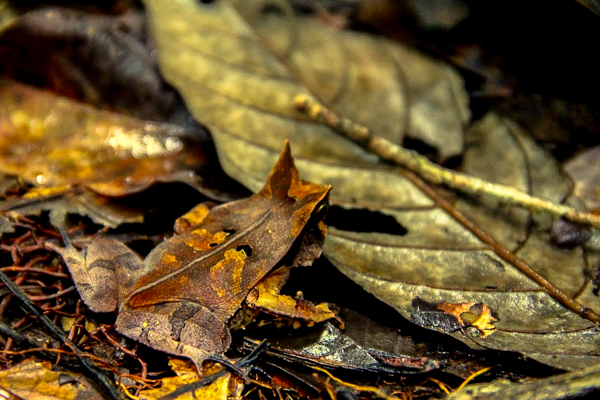 The most interesting part was about ayahuasca, a hallucinatory liquid made from plant extracts. Widely used in large parts of South America to this day, ayahuasca has traditionally been consumed by shamans to enter a spiritual state in which they can for instance find their spirit animal. However, since the shaman only spoke Spanish and the guide’s translation focused on the broad strokes, a non-Spanish speaker would have missed out on a few important points. Day 4: Thank You Amazon Tour, You’ve Been Amazing! After two full days of Amazon rainforest fun, we headed back to Quito around noon on the fourth day. Before jumping in the canoes, though, we climbed the 25 m high birdwatching tower to watch the rainforest awake one last time. As the cherry on top, on the canoe ride back to the bus, we finally saw an anaconda sunbathing on a branch just above the water surface. Pretty perfect ending to my Amazon adventure, right? There he is, the big bad anaconda that we waited so long to see! Who Did I Do My Amazon Tour With? I booked my tour through Community Hostel in Quito and highly recommend their Amazon tours. How Much Does An Amazon Tour Cost? I chose the 4-day tour which costs $270 per person. What Was Included In The Price? The price included all meals and bottles of purified water for the entire tour. Rain ponchos and rubber boots were lent to us by the Guacamayo Ecolodge on request. The price did not include transport to and from Quito nor a $8 community contribution which is payable on arrival to the launching point of the canoes. Epic blog and epic post! LOVE those pics. Suzy looks beautiful. I hear ya on the bullet ants too! 1 year ago we did a house sit in remote Costa Rican jungles. By Bribri but a 3 hour walk into the hut. Bullet ants were a dime a dozen. I saw them everywhere and had to whip them off the kitchen sink. 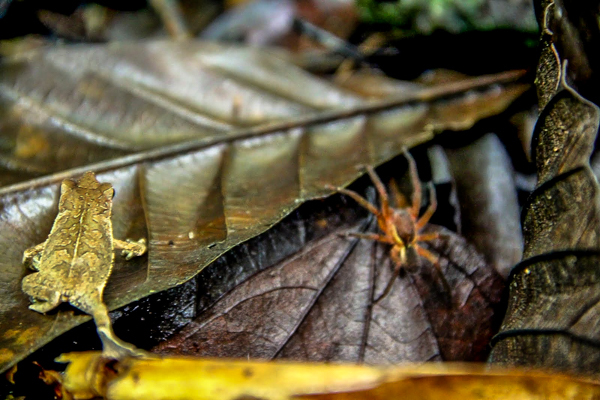 Ditto on poison dart frogs, centipedes, all types of usually rare but not down there animals. Thanks for sharing! Haha thanks for the kind words! 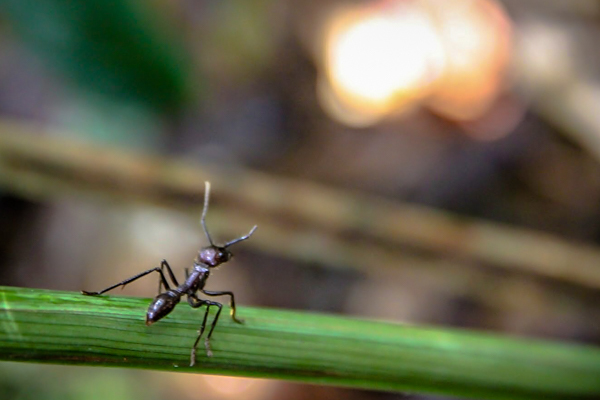 House sitting in the Costa Rican jungle must have been quite an adventure, I’m sure you got to meet a lot of the locals (ie the bugs) 😉 Not too jealous about the bullet ants though, ouch! Great blog post, I’m hoping to do the Amazon at some point next year and this is a great insight. I’m sure you’ll love your Amazon adventure, just watch out for those spiders! Lovely trip, I have travelled to other parts of the Ecuadorian Amazon but have not yet been to the Cuyabeno–your blog was useful. However, I must say that as an Ecuadorian-American I find your comments about Indigenous peoples quite patronizing and problematic. Blaming people for your “unauthentic” visit clearly shows how you are romanticizing Indigenous peoples–to look and act a certain way. Having cellphones does not take away from people’s “authenticity,” just like wearing “normal” clothing (I’m assuming you meant to say Anglo-Western) doesn’t make Indigenous peoples less authentic. Rather than “blaming” people, perhaps you might want to ask yourself who are you to determine what is authentic or not? who are you to say what is “normal” or not? Maybe answering these questions might allow you to understand why the woman who shared her cultural knowledge with you changed her clothing. All in all, I suggest you do some research about your role as a tourist when visiting Indigenous communities in the future. Other than this, sounds like a great trip!